This already looks much more impressive and distinctive than the current model. The interior is also a big step up. Now looking much more premium. Not many specs are available. Except the size. At almost 188 long, it is both longer than the current Santa Fe sport. But shorter than the 7 seater Santa Fe. So, not sure how many seats this new one has. Either a roomier 5 seater, or a more cramped 7 seater? Notice that it is 10 inches shorter than the Subaru Ascent. Almost 8 inches shorter than the Honda Pilot. And still about 5 inches shorter than the Toyota Highlander. So I would guess the new Santa Fe being introduced this week is a new 5 seater. OMG, this looks not only new and original but also even futuristic! I am quite amazed! Front fog lights and openings are way to big, other than that, it looks slightly better than the outgoing model. Ugh. I strongly DISLIKE the split headlight look on ANY vehicle. Jeep just thankfully got rid of that look on the Cherokee and Nissan replaced the bug eyed Juke with the normal looking KICKS. Sadly it seems Hyundai is doing the opposite and spreading this look across its line up. The interior is looking good though. Also, do you really think there's going to be two versions of this? It seems they split the difference size wise between the old Sport and old 7 seat model. I'm guessing this was done intentionally. I predict this will be a 5 seat model only. It leaves room at the bottom for the Tuscon to grow in size a bit and leaves room at the top for a bigger new 7 passenger model. I wonder if they are going to cede the 7-seater market to Genesis the way they dropped the Azera in favor of the G80? Seems to be a bad move considring they don't have a minivan anymore either. I'm pleasantly surprised! This is the first time I've seen this look and wasn't completely turned off? Perhaps the Juke, Cherokee, and the Citroen brand conditioned us to it? Either way it's perfected and refined what I used to call a "bug eyed and eye browed" look. This is one incredibly gorgeous vehicle! With the Kona and this new gen Santa Fe, Hyundai has singlehandedly perfected the split light front end treatment! Hyundai has also managed to design different sized crossovers that share design traits, but still have their own distinct appearances! This will be the best looking midsize crossover when it arrives on the market! 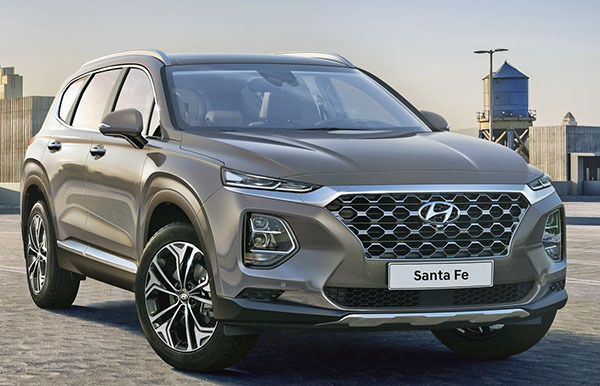 As far as size, I wonder if the new Santa Fe will be a two row model only that will compete against the Ford Edge and Nissan Murano (and possibly a future Honda Passport). Maybe Hyundai will resurrect the “Veracruz” name for a larger three row CUV to compete against the Pilot, Highlander, Explorer, Pathfinder, Atlas, Ascent, CX-9, and Traverse (as well as sister brand Kia’s Sorento). This is just speculation, so we’ll have to wait and see what Hyundai actually does. Major improvement on all accounts. Very nicely done Hyundai. in and out, i think it looks fantastic....aggressive front end, very nice interior.